If you have family from Oklahoma, the way The Legal Genealogist does, clear the decks for Monday, January 9th. Tell the kids and the spouse they’re on their own for dinner. Tell the dog he’ll have to take his own walk. Tell the cat she knows how to open the treats jar. Oh, boy will you be busy. Because on Monday, January 9th, the Oklahoma State Department of Health (OSDH) is launching one of the most user-friendly comprehensive index sites for vital records available anywhere. And then the fun will begin. 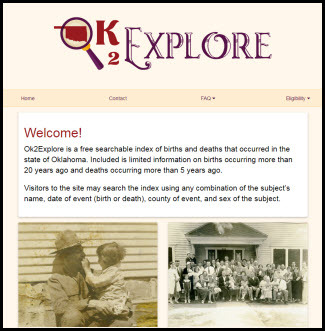 OK2Explore will allow users to search records of births occurring more than 20 years ago and deaths occurring more than five years ago, and to purchase copies if they are either eligible to do so or if the records are now old enough to be considered public. The website came about after legislation was passed in 2016, authored by Rep. Elise Hall, Sen. David Holt and Sen. Anastasia Pittman. The legislation provided that records of births that occurred more than 125 years ago and records of deaths occurring more than 50 years ago should be open record, and opened an even more comprehensive set of birth and death indexes to the public. “Vital Records has worked diligently over the years to preserve the integrity of the birth and death records, protect the identity of our citizens, and we continue to preserve the historical documents of our state and our families,” said Baker. Going the next step to make the index available required development of a whole new online research tool, but the Vital Records team not only rose to the challenge — they beat the deadline set by the Legislature by six full months. “Given recent technology advances, we are very pleased to have an opportunity … to provide this new tool to the public at no charge.” Baker added. The birth and death indexes on the website will be updated monthly with new records and corrections. The site cautions that users need to be aware that “there will be some errors due to a doctor or funeral director making a mistake when filling out a record, the family not providing the correct information, …difficulty in reading the handwriting, typographical error,” and the like. Researchers who want to order an actual copy of a non-public birth or death record will be required to meet the state eligibility requirements (see this link for birth records and this link for death records). For public records (births that occurred more than 125 years ago and records of deaths occurring more than 50 years), there isn’t any eligibility issue, but applications, payment and identification are required. Thank you, Oklahoma… is it Monday at 6 p.m. CST yet? Thanks! A joy to see. I am looking forward to this tool. Wow! Thanks, Judy – and I will be up early Tuesday at 06h00 GMT+2 when N. America is still snoozing …. That’s my great-grandma’s brother who was there, my g/f’s cousin was the postmistress in Goodnight OK ….. Thanks and comps. to all who made this happen. Much appreciated. For death records, you might even try searching now, David (parts of the site are already working…). I’m doing a happy dance! ! You’re right, Judy, I will be busy. I know of 33 deaths of relatives and collaterals in OK–probably more. I haven’t counte births yet. Thank you so much to all who made this happen! This is wonderful! This is wonderful! Thank you, Judy, for making us aware of this new opportunity. I lived in Oklahoma for 31 years, 1957-1988. My uncle on my dad’s Hollingsworth side lived there from the 1920s and my three children’s Littlejohn ancestors lived in Oklahoma since Oklahoma Territorial Days. My parents lived there from 1957-2005. Many family members are buried in Oklahoma. Linda, Who is your Hollingsworth family? My granddaddy was Jeff Hollingsworth from Mangum and Delhi area also lived in Hammon where my daddy Bob Hollingsworth was born. His brother was Edmond. I have lots of genealogy. I now live in Heavener, Ok. Bobbie Hollingsworth Morrison. Have Facebook page. These are Oklahoma State records, not Cherokee Nation records. To the extent that the Cherokee Nation kept any of its own records that weren’t reported to the State, they won’t be included. I tried to order a death certificate (using the link to Vital Chek) for a death that took place more than 50 years ago, but the same restrictions apply. I must be a family member. I am not a family member. So, I am again blocked from obtaining the record. So disappointing. No, you don’t have to be a family member. Use the contact address on the website and let them know there’s a problem with that record — and remember, the site really isn’t supposed to be live until Monday. Thank you. However, I just opened up the application to fill out and mail, and it doesn’t even have genealogy listed under “eligibility,” and it still says that death records more than 75 years old (not 50 years old) are open records. I understand, but remember: this isn’t supposed to be live until Monday, and if there’s still a problem then, you need to report it via the contact address on the website. I just got what I wanted for Christmas! Oklahoma is indeed OK! Update: I went through the process of ordering a death certificate from 1943 this morning, through Vital Chek. When I got to the end, I received an email stating that I had to send verification of my relationship to the person. So, I called OK Vital Records and spoke to a very helpful person who stated that they were working with Vital Chek concerning this issue. She approved my application for the death certificate over the phone. So now, in about 5-10 days, it will be Christmas at my house! Oklahoma is definitely committed to getting all the bugs worked out and making this system work. SO very glad! The death certificate arrived yesterday–only one day after I ordered it. I paid for Vital Chek’s service, but this was really fast. So, what information was entered about the man’s parents? “DK” for both! LOL. At least I have other information about his parents. I’m still grateful to Oklahoma for the opportunity to obtain the death certificate. Hope this works out well. I’ve been trying to find my ancestors for over a year and this should help a lot. It’s working nicely, so give it a try! I know I shouldn’t complain, but I’m disappointed in the website. It doesn’t allow broad searches (i.e. I’d like the birth info for everyone with a specific surname). Instead of a list of names, I get a message to be more specific because there are “too many” records. OK. How about giving me only males with that surname. Nope. “Too many records.” OK. How about giving me just the people in a specific county with that surname. Nope. “Too many records.” How about giving me my father’s birth information. “No record.” (There is a record. He filed a delayed birth record and I have a copy of it.) And even if it were to provide a list of people, because the parents aren’t listed, I can’t tell if the record I’m looking at is for MY John Jones. Please tell me this is just the beginning and there are numerous enhancements planned for this site’s capabilities! Hmmmm. I guess they didn’t want to hear it! Something else to add as an opportunity for improvement…. Ouch. You can try again from the Contact link on the website (in case my link was copied wrong). But ouch.